It’s the Sweetest Day of the Year! Held annually on the second Saturday in June in Downtown Midland, Ontario, Canada, it’s a street festival dedicated to Canada’s most iconic dessert: the butter tart. Indulge your sweet tooth and enjoy music, artisans, performers, and check out the butter tart contest too! Party on the Dock makes the beginning of summer official. Join hundreds of like-minded partiers for great music, dancing and more – all while helping a great cause. Party On The Dock is presented by the Midland Rotary Club to raise funds to support special causes in our community. To date, the Party on the Dock has raised over $500,000 for our community! 100% of net proceeds support our community and international charitable causes including Hospice Huronia, Big Brothers/Big Sisters, We Are The Villagers, and Boys and Girls Club. National Indigenous Peoples Day is a time for all Canadians to celebrate the cultures and contributions to Canada of Indigenous peoples, Inuit, and Métis peoples. Held at Sainte-Marie among the Hurons, the event offers Indigenous singing, drumming and dancing. Indigenous displays and demonstrations include kid’s heritage crafts, waterway and lacrosse demonstrations, Indigenous crafters, and more. Midland Rib Fest is the best way to celebrate your love for BBQ and CRAFT BEER! 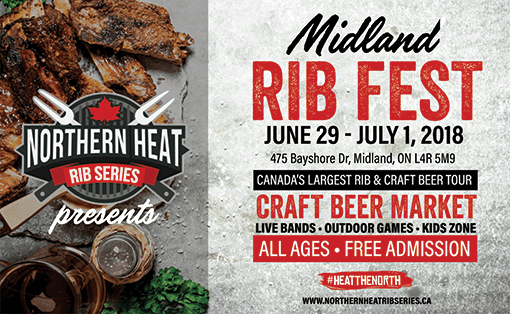 Northern Heat Rib Series is bringing the BEST BBQ in CANADA right to your backyard! Join us for a weekend full of food, fun, and entertainment as you enjoy all the event has to offer. Check out the new Craft Beer Market featuring: Flying Monkeys, Barnstormer Brewing, Iconic Brewing, Highlander Brewing, Naughty Otter and more. 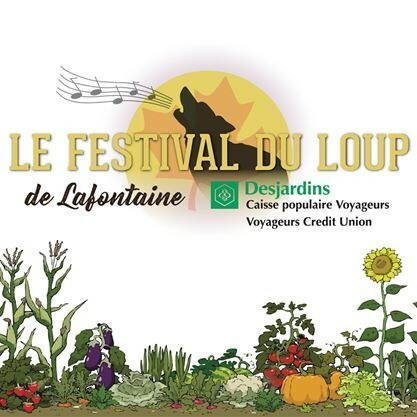 Le Festival du Loup celebrates the francophone music, culture and history of the Lafontaine region. The spirit of a legendary wolf comes to reunite people for a common cause: that of celebrating its heritage and culture. Don’t miss this great event! Live music, storytelling, theatrical performances, tractor parade, activities for children, wolf auction, agri-food zone, howling contest, local vendors, and much more! Feast Fest is a Food, Drink & Music Festival visiting Sudbury & Midland Ontario in 2018. The second annual Feast Fest will offer patrons an array of arts, crafts, live music a kids-zone/midway, and of course food options for all tastes! Feast Fest is in support of the local Food Bank through select charitable programming, with 100% of net proceeds through charitable programming going to the local food bank. 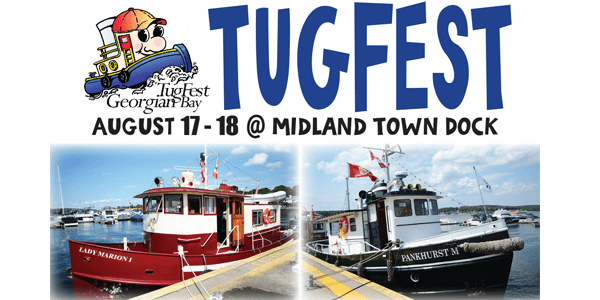 TugFest & HarbourFair offer visitors a full lineup of marine and family entertainment activities including the spectacular tugboat parade of lights, tug parade, tug races, the entertaining Tug Push and the ever popular tour of the boats. At the same time, there is continuous entertainment, displays, vendors, artists and kids and family activities on the dock. Pumpkinferno sails into Discovery Harbour for a hauntingly good time! A ghost ship lurks in the stormy waters, while a fire-breathing dragon awaits onshore. Experience the phenomenon of Pumpkinferno’s magical outdoor exhibits of hand-carved pumpkins and for those looking to test their courage make your way through the Terror Zone, where zombie’s, clowns and witches lurk in the shadows! Sainte-Marie’s “First Light” is a must-see event with a great line-up of family activities and performers, all amidst the spectacular glow of over 5,000 candles. The magic begins when visitors approach the candlelit historic site, as a beautiful amber glow illuminates the famous 17th-century mission. 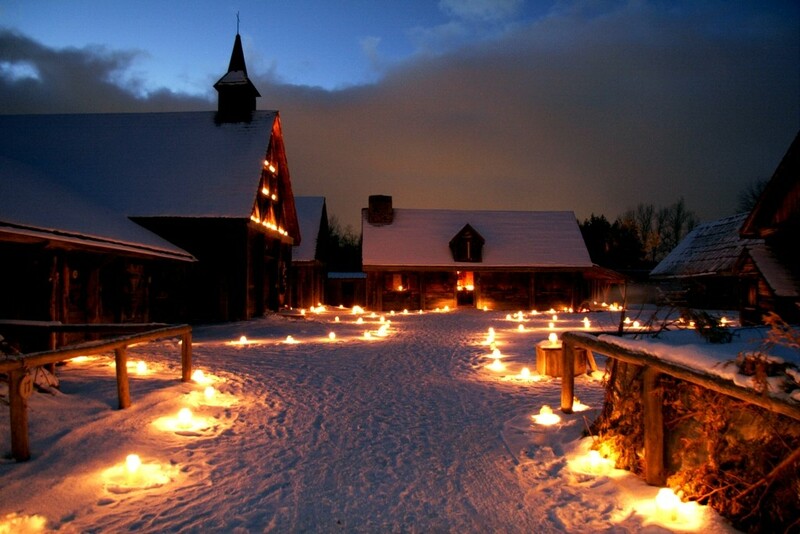 Visitors can stroll the candlelit paths which lead to a variety of fun family activities. The cookhouse is filled with the sights and smells of delicious baked goods and cookie samples available for tasting. Historic blacksmithing will also be demonstrated, and a Nativity crèche will be on display in the stables near the Farmer’s Dwelling. Always popular with little folks, corn husk doll making will be offered in the Sainte-Marie foyer. “First Light” has strong ties to community groups, and many are involved in the celebration, offering special “hands-on” children’s crafts and historic demonstrations. An abundance of music will also fill the air, including Native drumming and singing, lively Franco-Ontarian folksongs, and delightful community and school choirs performing seasonal music over the nine evenings.